Every now and then I like to bake bread. These panini all’olio are soft buns with a very thin crust made with extra virgin olive oil. Wrapped in a paper bag they will be good also the day after. I like them with some prosciutto crudo or with butter and jam for my brakfast! I followed the recipe from VivaLaFocaccia.com (this recipe), a fantastic blog of an italian living in California with the passion for home bread baking, thank you Vittorio! He has many excellent video recipes on his blog, my favorite is the Focaccia Genovese. I translate here the recipe with only two slight changes: I did not add the egg and I used an electric mixer. In a bowl dissolve the yeast in the warm water (slightly warmed to 30C – 86F). Add the olive oil and the sugar and mix well. Add half of the flour (250g) and mix until all the flour is incorporated. When the flour is incorporated, add the salt. This way the salt will not be in direct contact with the yeast. Add half of the remaining flour (125g) and mix until all the flour is incorporated. Keep mixing and gradually add the rest of the flour (125g) until you incorporated all the flour. Keep mixing for about 10 or 15 minutes to obtain a very smooth dough. Cover the dough with some clear plastic wrap and a towel. Let rise for 1 hour. Divide the dough in pieces of about 100g. Flatten each piece in a rectangular shape, and roll it on itself forming a long and thin cylinder. This step is necessary for a good rise of the bread. Then roll the the cylinder on itself in the opposite direction to form a spiral like a snail. You can make other shapes, like a braid or a knot. Watch Vittorio’s video for a detailed tutorial. If you want brush the surface of the buns with water and sprinkle with some sesame seads. 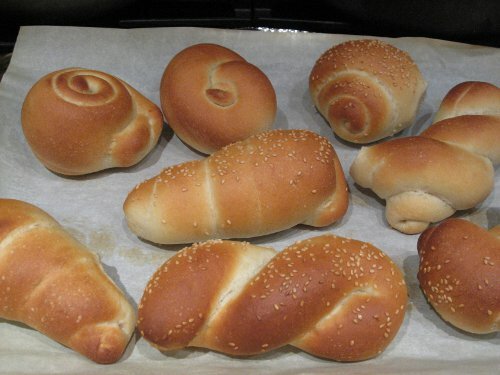 Put the buns on a baking sheet covered with parchment paper. Cover the buns with clear plastic wrap. Put them in the oven turned off with the oven light on. Let them rise for 45 minutes. Take the buns out of the oven. Preheat the oven to 430F. 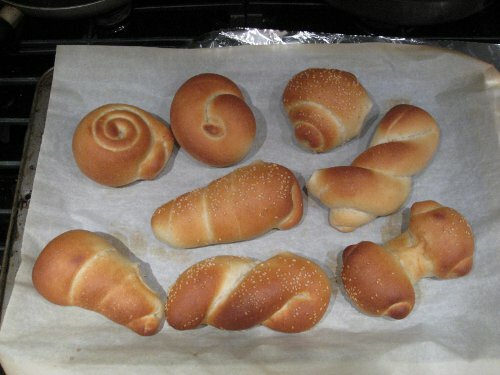 When the oven reached the set temperature, bake the buns for about 10 minutes or until golden. Right before baking spray the buns with water, and also spray some water on the bottom of the oven for moisture while baking. I use a convection oven, with a regular oven you may try 440F and bake a bit longer for 12 or 15 min. Take them out when golden. After step 3 (shape the buns) you can freeze the buns. Take them out of the freezer 8 to 10 hours before baking, to let them thaw and rise. Then bake them as in step 5.